In recent years the market share of variable geometry turbochargers has been increasing steadily due to the trends of engine downsizing driving development in the field. For more information on these factors which motivate the development of turbocharging technology, see here. It can be very difficult to find reliable market data without paying thousands of pounds for marketing reports from professional marketing companies. However for the purpose of illustration some data can be obtained freely to describe how variable geometry devices have been taking control of the turbocharging market. 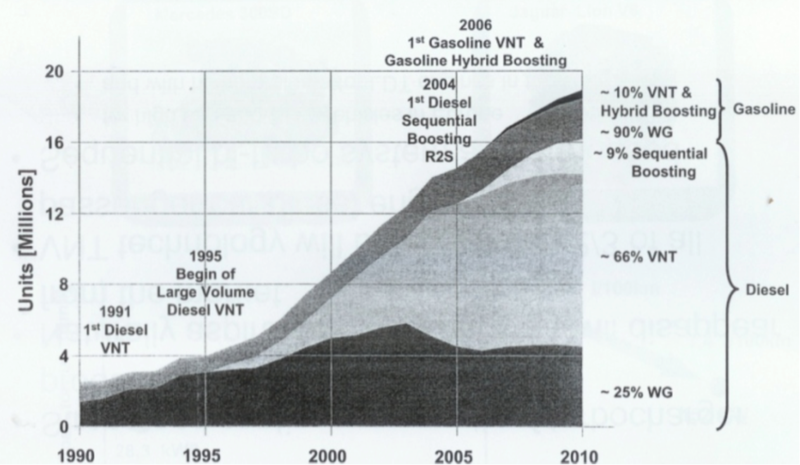 The chart below plots the advance of VGT (Also known as VNT, Variable Nozzle Turbocharger) from the early 1990's up until 2010. It can be clearly seen that VNT (VGT) technology makes up a vast section of the diesel market, but only 10% of the gasoline market. This is down to challenges associated with applying variable geometry turbo technology to the high temperature exhaust gases present in gasoline engines, which can be up to 1050 degrees Celsius.